On July 23, EARTH University’s Precision Agriculture Center held an event for the farmers benefitting from its technical trainings and support. 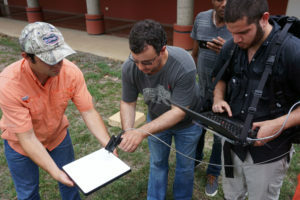 The Center – located on EARTH’s La Flor campus in Liberia, Guanacaste – revealed the results observed from the introduction of precision agriculture in the region. Experts from the Precision Agriculture Center of EARTH University show how to make hyperspectral calibration. Precision ag involves the methodical application of inputs (i.e., the exact amount to a particular part of the plant at the optimal time). It also calls for the use of diverse technologies in real time – such as GPS, drones and specialized cameras – offering the farmer accurate data to help reduce employment of chemical additives and, by extension, damage to the surrounding ecosystem. Since being founded in 2016 by EARTH and Costa Rica’s Development Bank, the Center has been placing data and technology in the hands of producers from small- and medium-sized farms in the surrounding province of Guanacaste and the Chorotega region. These efforts serve not only to boost yields and decrease resource use, they also strengthen the industry’s resilience in the face of climate change. Precision ag trials in the area were run on selected sugarcane, mango, grass, orange, rice and melon fields. The Precision Agriculture Center maintains its financial sustainability, offering at-cost services to beneficiaries of Costa Rican Law No. 9274. The Center already has been contacted by producers to help implement precision ag systems within their farms.